Riding a horse in a correct frame is so beneficial to their well-being because it prevents injury, builds his topline, and makes him stronger and more adjustable. Not to mention, riding a horse in a frame can avoid you having to fight with him every step of your ride! I always establish the frame at the walk first. This sets the stage for the rest of your ride and allows the horse to become familiar with what you are asking before moving to a more difficult task. In my experience, the frame will differ based upon the discipline. Most hunters will have their nose perpendicular to the ground or slightly out, while equitation horses will almost always have their nose perpendicular to the ground. I usually want my equitation and jumper horses to have their frame break higher than the hunter frame, so that their poll is higher than withers. It’s also very important to remember that the frame MUST be developed from your leg first! The leg helps the horse to stay balanced and soft. I always use my leg to push the horse through his hind end and then add the rein aid to stop the forward momentum, which allows the horse to lower his head. I’m wearing my DeNiro boots, which I absolutely love! Their leather is super soft, which makes them easy to break in, but they still hold their shape. Check out their website to see all of the beautiful styles they offer! Here, I’m working the horse on a circle to help him balance and to create lightness in my hands. I love that this picture shows off my riding top from Anique and sweater from Sheln! Both are super soft and comfortable and can be worn on their own or layered like I have them here. If you find that your horse is resisting the frame, try putting him on circles of different sizes and riding lots of changes of direction. Remember to keep a steady rein and your leg on while doing this to encourage him to soften. I also like to use the sitting trot to help horses who struggle with finding a correct frame. Once he gets the idea, you can soften the inside rein to reward him, but it’s important to keep steady pressure on the outside rein as well as lightly check him with the inside rein every few steps to keep the frame. The same idea can be used at the canter, but you may have to increase the intensity of your aids depending on the horse. These tips can also be useful to soften a very heavy horse. I was also wearing my black Roeckl gloves. I really like that they don’t wear out easily, even when I’m riding strong horses. Roeckl has several other glove styles that are an excellent addition to any wardrobe! The horse that I’m riding in these photos is green, so he is just learning to be ridden in a proper frame. It’s important to remember that if your horse is also green, or is new to the idea of a frame, to be patient and give him lots of breaks. 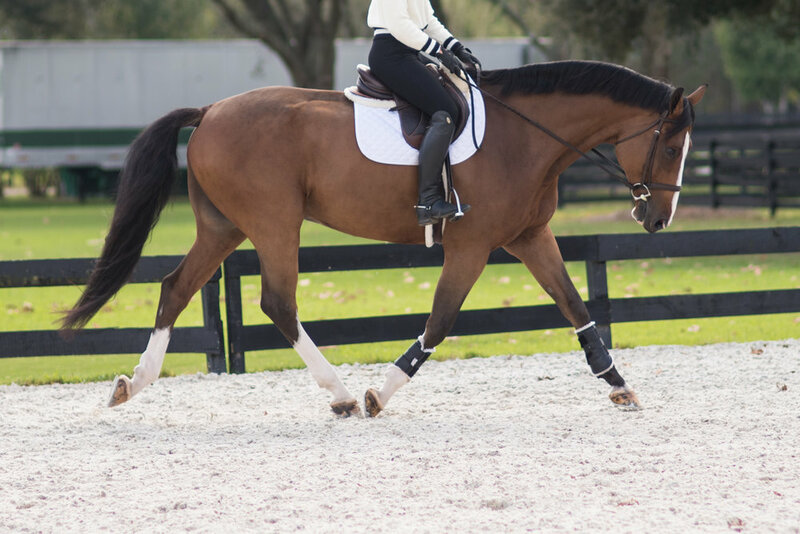 It can be tough to teach a horse to go in a correct frame, but it’s definitely worth the work!